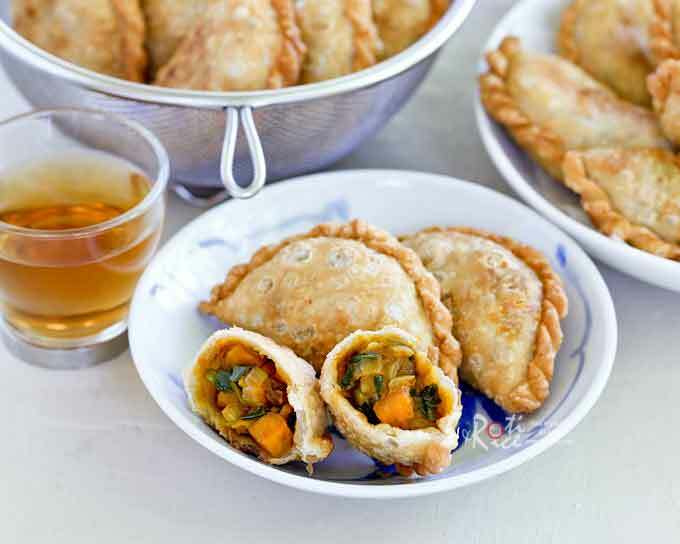 These Malaysian Cafeteria Style Karipap (Curry Puffs) with blistered crust and curried potato filling make a delicious snack or tea time treat. Hold on to you hats, folks! 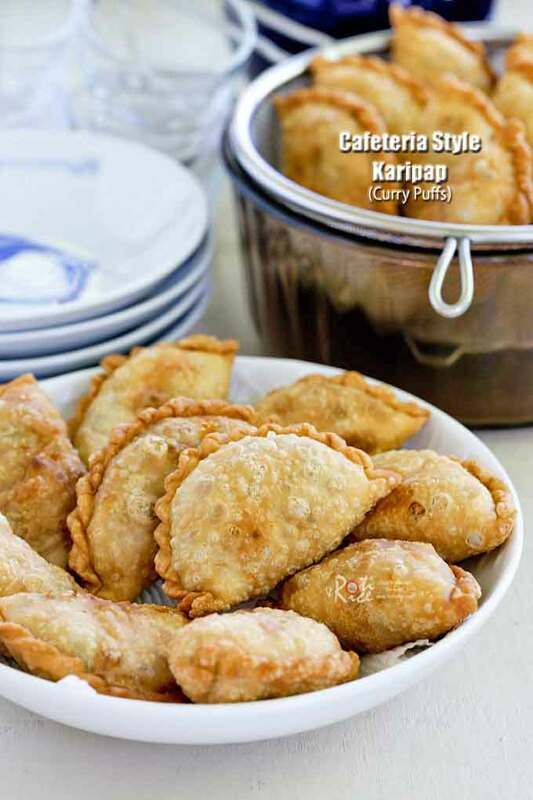 Here are the canteen or Cafeteria Style Karipap (Curry Puffs) you have been waiting for. If you are no idea of what I am talking about, please check out this other Karipap post. For the rest of you who have been following the narrative, especially on my Facebook Page, let’s get rolling! 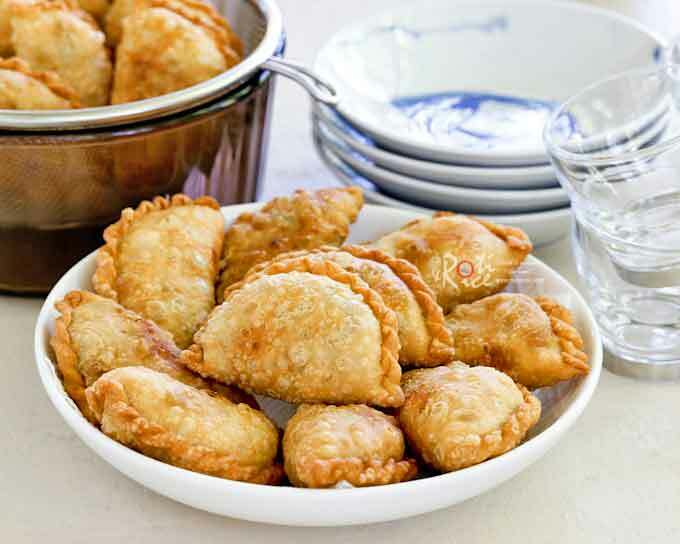 Most people familiar with Malaysian snack foods will tell you that the Malay style curry puffs, fondly known as Karipap usually (but not always) comes with a blistered crust. This does not mean the other is not tasty. On the contrary as stated in my previous post, the smooth crust Karipap had a richer flavor and more flaky pastry. This was confirmed by my taste testers. However, if appearance and nostalgia is important to you, then you may like today’s recipe a little better. The pastry is lighter and just a wee bit crunchier. To be honest with you, I was a little torn myself if I had to choose. In the end, it is a matter of preference. The good thing is that, I have both recipes here for you and you can decide for yourself which one you prefer. Do let me know your preference once you have had the chance to try both recipes. 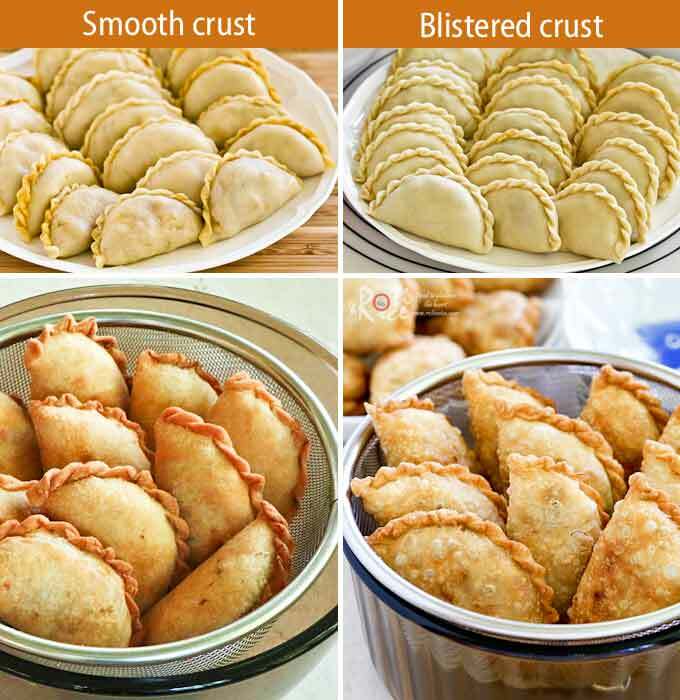 So, what made today’s Cafeteria Style Karipap (Curry Puffs) pastry blister? It is not a longer frying time as suggested by some. It is actually non other than the one simple ingredient known as WATER! Remember, water sputters when it meets hot oil and that sputtering is what causes the pastry to blister. 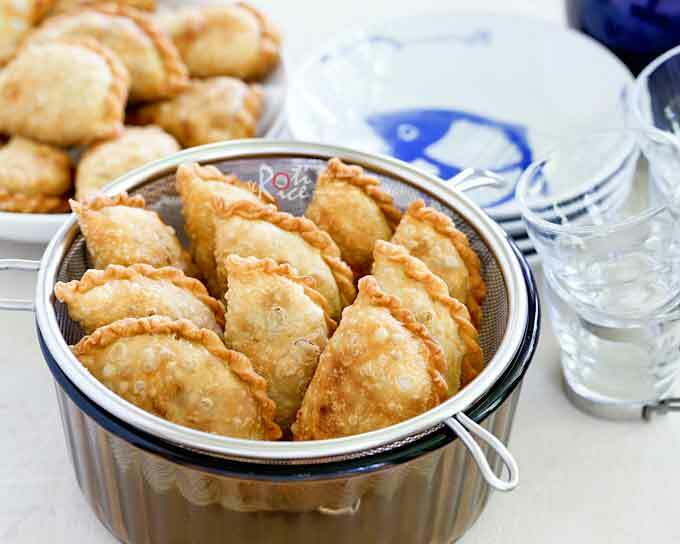 When these curry puffs were frying in the pan, you can definitely hear the sputtering and fizzing in the hot oil. Hence, the texture is discernibly crunchier. In this recipe, all other ingredients for the crust remained the same as the previous recipe. I simply halved the amount of margarine used and made it up by adding sufficient water to knead the dough into a smooth ball. It was a success! I was happy it turned out so beautifully on my very first try. The pastry blistered evenly when the curry puffs were deep frying. These Karipap were relatively inexpensive snacks and the makciks (aunties) who made them had to find a way to keep the cost down. Using less margarine and more water would work for the pastry. As for the filling, sweet potatoes were used instead of regular potatoes. Back then sweet potatoes cost less than regular potatoes. This time round, I flavored the potatoes with ku chai (Chinese chives) instead of cilantro. All other ingredients remain the same. There wasn’t a whole lot of difference between the two. One other option as mentioned in my previous post, is to use Chinese celery which has a stronger flavor than regular celery. The choice is yours but either way, you can’t go wrong. Add cubed potatoes and sweet potato. Stir to coat potatoes with spices. Pour in water and season with salt. Add chopped Chinese chives and continue to stir to get everything well mixed. Combine all-purpose flour, salt, and margarine in a large bowl. Mix with a spatula. Slowly add water a little at a time. Knead to form a soft, non-sticky dough. You may or may not require the full 2/3 cup (160ml) water. Note: To make ahead, shape karipap and store in the refrigerator the day before. Deep fry the next day when ready to eat. To make ahead, shape karipap and store in the refrigerator the day before. Deep fry the next day when ready to eat. This sounds so delicious! I can see this making the perfect lunch or a quick and tasty snack. Love that it’s vegetarian too! I was wondering if you could eliminate the sweet potato and just add another regular potato? (I’m not a big fan of sweet potato.) Thanks for such a tasty and cute recipe! Yes, you can use regular potatoes. 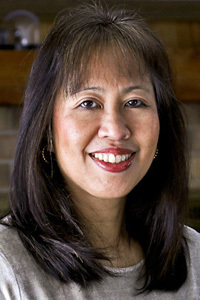 Linda, instead of margarine, can butter be used? Yes, you can use butter. This might sound like a weird question so let me explain. Here in California they sell sweet potato fries but they are really made out of yams. And in the stores they sell sweet potatoes and yams side by side but sometimes the yams are labeled sweet potatoes and the sweet potatoes are labeled yams. So confusing for a beginning cook. So the question is in the recipe are you calling for a yam or a sweet potato? So glad I found this blistered crust recipe as this was what I grew up with! Most other recipes are for flaky or the the smooth crust variation. I’dways buy these at the pasar pagi in Malaysia. I did not have margarine or butter on hand so I substituted with vegetable oil and the crust still turned out good. I used my own recipe for the filling so can’t comment on this one. Thank you for posting! Thank you for such a good and accurate recipe. I tried both your smooth crust recipe and the blistered crust recipe. After trying out the smooth crust recipe, I was so sure I would like the smooth crust one more than the blistered crust even before trying out the blistered crust recipe. But to my surprise, the blistered crust ones turned out to be just as nice! Love them both! Perhaps in terms of presentation, I will choose smooth crust over blistered crust. Definitely will be making more of them! I love Curry puffs! May I know the ration of potato to sweet potato? The recipe in gram confuses me. I was trying to achieve an almost a 1:1 ratio of potatoes and sweet potatoes but you can use whatever ratio you prefer. 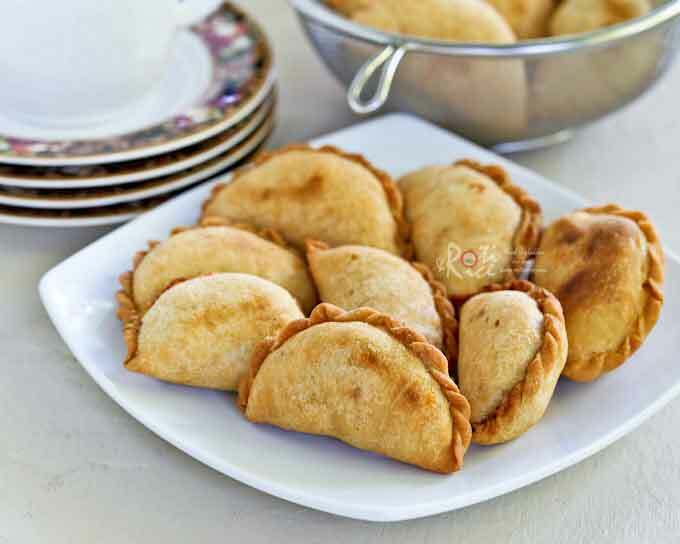 Love to eat curry puff and can’t wait to try to make it! If I will like to keep it for a while, how long do u think it will last in the refrigerator, or Shaping the curry puff many days ahead and just frying it when I want to eat it is better? Thanks! I don’t know about shaping them many days ahead but one or two days in the refrigerator is fine.